For a Limited Time receive the Flex Polisher Instructional DVD and a Mike Phillips’ The Complete Guide to a Show Car Shine Paperback Book FREE with your purchase! Retail Value $32.98. A complete FLEX starter kit! Customize the FLEX XC3401 VRG Dual Action 6.5 inch Pad Kit by choosing your own pads! 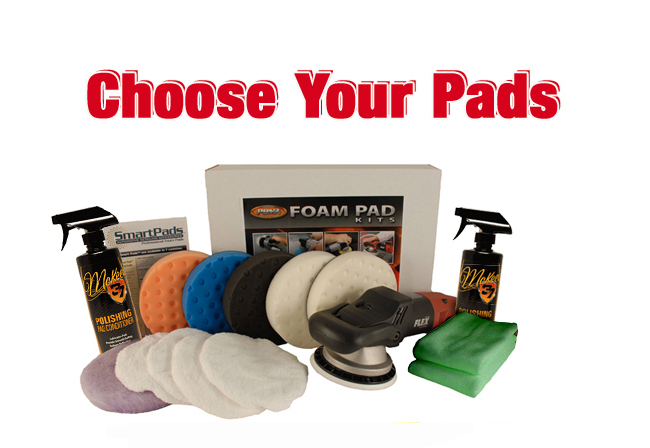 Select any five pads from the options listed below. Choose all one color or mix it up. Any combination of pads is the same low price. The FLEX XC3401 VRG Dual Action 6.5 inch Pad Kit gets you started on the path to a flawless finish with the FLEX XC3401 VRG Polisher and Lake Country foam buffing pads. This true dual action polisher is powerful enough to remove swirls and scratches, yet it has all the user-friendly features you’d expect from a dual action orbital polisher. Save on this complete starter package! The FLEX XC3401 VRG Orbital Polisher is a professional grade dual action polisher with more power and a longer stroke length than an average DA buffer. The increased power and range of motion give the FLEX more paint correcting ability while still maintaining the safe, orbital motion of the pad. Novices and professional detailers will appreciate the solid construction, dependable performance, and paint-safe features of the FLEX XC3401 VRG Orbital Polisher. Pinnacle XMT Polishing Pad Cleaner contains a degreasing agent that breaks up oil and eliminates every last trace of residue. Soap (as in dish soap) can leave a residue of its own, so there is no soap in this cleaner. Intense cleaners and degreasers break up oily deposits left by car care products so the pad rinses completely clean. This pad cleaner is ready to use in a convenient pump spray bottle. Prevention of dry buffing is as easy as misting an unused pad with Pinnacle XMT Polishing Pad Conditioner. It only takes a couple of spritzes to prep the pad for polishing. The rich lubricants instantly penetrate the pad, softening and conditioning the material. Even if the pad has never been used, it will glide across the paint like you’re halfway through the detail session. Yellow Cutting Foams 6.5"- Use this pad to apply compounds or polishes to remove severe oxidation, swirls, and scratches. It is the most aggressive and should only be used on oxidized and older finishes. Always follow this pad with an orange or white pad and a fine polish to refine the paint until it is smooth. Orange Light Cutting Foam 6.5"- Firm, high density foam for scratch and defect removal. Use this pad with polishes and swirl removers. It’s an all around pad that will work on most light to moderate imperfections. White Polishing Foam 6.5"- Less dense foam formula for the application of waxes, micro-fine polishes and sealants. This pad has very light cutting power so its perfect for pre-wax cleaners. Green Polishing/Finishing Foam 6.5" - Use this foam to apply one-step cleaner waxes. It is a balance of polishing and finishing that is perfect for all-in-one product application. Gray Finishing Foam 6.5" - Composition is firm enough to withstand added pressure during final finishing to remove buffer swirls. It has no cut and will apply thin, even coats of waxes, sealants, and glazes. Blue Finessing Foam 6.5” – The blue pad has soft composition for applying glaze, finishing polish, sealants, and liquid waxes. CCS Red Ultrasoft Wax/Sealant Foam 6.5" - This soft, imported foam is ideal for applying the final coat of wax or sealant. The foam works especially well when applying liquid waxes or sealants because it is firm enough to keep the majority of the product on the paint, rather than soaking it up. The red foam has no cut or cleaning ability. CCS Super Soft Gold Jewelling Foam Pad 6.5" - The CCS Super Soft Gold Jewelling Pad is made of Lake Country's softest foam. Use the gold pad to apply a very fine polish or glaze as the final step of the polishing process. Jewelling is the term coined for this step because it intensifies gloss and reflectivity, like a jewel. The gold foam pad also works well for wax and sealant application. A total retail value of $556.88. Save $81.88!